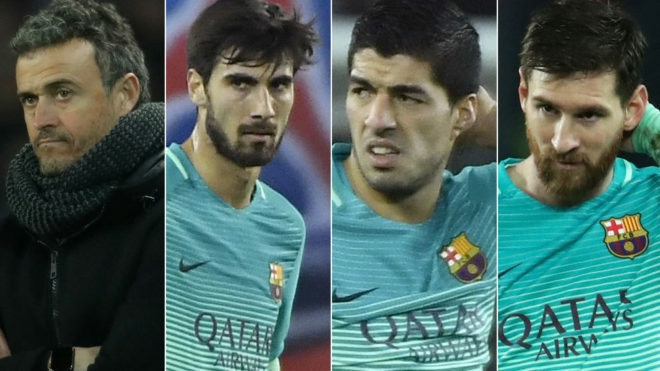 The blacklist from Paris: Enrique, Gomes, Suarez and … Messi! Supporters have voted on the performance of Barcelona’s players on one of the most disappointing nights in their history in the Champions League. A double from Angel Di Maria and goals from Julian Draxler and Edinson Cavani have all-but ended the Blaugrana’s hopes of progressing to the quarter-final stage. The man who received the most negative votes on MARCA.com for his part in the display was coach Luis Enrique, followed by midfielder Andre Gomes, who was completely overrun in the centre of the park. The Portuguese international was also voted as the worst player on the pitch in the separate MARCA English poll, with Sergi Roberto and Luis Suarez also slated. Back in the Spanish vote, Suarez and Lionel Messi followed Gomes, with only 1,900 giving the Uruguayan a positive vote and roughly 2,100 doing the same for the Blaugrana No. 10. Behind them came Sergio Busquets and Sergi Roberto, while only Marc-Andre ter Stegen and Neymar were given positive ratings for their part in the disaster by the majority of those who voted, both on MARCA and MARCA English – where Di Maria won the poll. It is clear that the public haven’t held back in pointing the finger and nobody was safe from it.